'Three Sides Live' was filmed in November 1981 on the 'Abacab' tour in North America and was originally released on VHS to coincide with the live album of the same name. The show focuses on tracks from the 'Duke' and 'Abacab' albums and the tracks are intercut with behind the scenes footage and interviews with the band members. After original singer Peter Gabriel left in 1975 and drummer Phil Collins took over that position, Genesis slowly transformed from a quirky, artsy Prog Rock band to a more pop-oriented group. By 1986’s mega-hit Invisible Touch, the Prog elements remained but the pop sensibility dominated. This means that Genesis circa the early Eighties presented a band in transition, as they’d not gone totally pop yet but they clearly trotted down that path. It’s this stage of the band’s evolution that we view in Three Sides Live, a concert program taken from Genesis’s 1981 tour. Undertaken to support that year’s Abacab, the program’s 12 tracks come from various parts of the band’s tenure. From Abacab itself, we find the title song, “Dodo/Lurker”, “No Reply At All”, “Who Dunnit?”, “Me and Sarah Jane” and “Man on the Corner”. 1980’s Duke produces an additional four tunes: “Behind The Lines”, “Duchess”, “Turn It On Again” and “Misunderstanding”. With 10 of the 12 spots occupied by those two then-recent albums, we get only two places to account for the rest of the band’s existence. “Afterglow” comes from 1977’s Wind & Wuthering, and a medley covers songs from the Peter Gabriel era. It melds 1974’s “In the Cage” and “The Colony of Slippermen” (The Lamb Lies Down on Broadway) with 1973’s “The Cinema Show” (Selling England By the Pound). Three Sides Live takes its title from the band’s 1982 double album, one that indeed included three sides of live material – in the US, at least, where the fourth side included a handful of studio numbers. In the UK, the album presented four sides of live material, which makes me wonder why it still got called Three Sides Live in that territory. Whatever the case, all versions of Three Sides shared this film edition’s concentration on the Abacab tour, though Three Sides the Blu-ray is the only one to focus entirely on that trek. As mentioned, the US Three Sides album included one side of studio songs, while the UK Three Sides used a few numbers recorded on earlier tours. While the album versions of Three Sides always present the songs in their entirety, the filmed one occasionally cuts away from the stage. For instance, we see Phil Collins chat with a Philadelphia radio host, and we also watch some backstage interactions and other non-concert material. This can become a bit of a distraction at times, mainly on the occasions where the interstitials directly interfere with the on-stage performances. That doesn’t happen all the time, but it’s not a good choice, and I’m not happy that some tracks get shortened even without cuts from the stage. Still, even with these bad decisions, I find a lot to like about Three Sides. 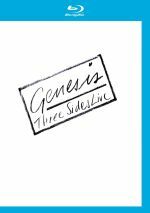 I’ve never been the world’s biggest Genesis fan, but I do like them, and Three Sides focuses on my favorite era of the band, as I think Duke and Abacab offered the best compromises between the band’s Prog past and their pop future. They were still a cult act – albeit one big enough to sell out basketball arenas – and hadn’t achieved true super-stardom yet; that “in-between phase” seemed to suit them, so I like the music of Three Sides a lot. The tracks get performed well, too. Genesis manages to add life to the songs in a live setting, so they play them in a tight, competent manner but don’t simply reproduce their studio versions without variation. The tunes find some room to breathe and work nicely in the concert venue. As for the visual depiction of the show, it also satisfies. Created in the very early years of the “MTV era”, director Stuart Orme keeps things fairly restrained. We get the occasional clever-clever bit – like overhead shots of Tony Banks on keyboards – but the program usually seems logical and appropriate. That doesn’t mean the presentation remains stodgy or static, though. Three Sides shows a good sense of visual energy as it captures the concert. Compared to more modern pieces, it probably looks a little quaint, but I’ll take that over gimmicks and rapid-cutting. It’d be nice to get an “extended edition” of Three Sides Live to cover the entire concert, if that’s possible – for all I know, no additional footage still exists. Until/unless a longer version gets the greenlight, I’ll remain satisfied with the original 1982 Three Sides. Despite a few dodgy choices, it gives us a good look at Genesis live circa 1981. Genesis: Three Sides Live appears in an aspect ratio of approximately 1.33:1 on this Blu-ray Disc. Shot on 16mm film, the results didn’t dazzle but they seemed pretty good – when I adjusted for the constraints of the source, that is. Sharpness was erratic. Close-ups manifested reasonably solid definition and delineation, but wider shots turned iffier. Those presented moderate softness and never seemed terribly concise. At least no issues with jagged edges or shimmering occurred, and I noticed no signs of edge enhancement. Source flaws were absent. You’ll notice some grain throughout the film, but that’s inevitable. As mentioned earlier, Three Sides was shot 16mm, and that format tends to be grainy. The grain was never a real distraction, though, and the rest of the program lacked any form of specks, marks, or other defects. Don’t expect a feast of colors from Three Sides, for it stayed with a restrained palette. Lighting offered most of the hues, and they were somewhat messy. The tones came across as well as I might expect, but they tended to be a bit on the heavy side. Black levels didn’t excel, but they seemed reasonably deep and solid. Shadow detail was a bit dense but worked acceptably well. No one will view Three Sides as a dynamic visual presentation, but I thought the transfer was good given the limitations of the source material. As for the concert’s DTS-HD MA 5.1 audio, it required no equivocation, as it delivered a positive auditory experience. The mix took advantage of the five speakers in an engaging manner. Vocals remained up-front, and most of the instruments concentrated on logical locations as well, with good stereo spread across the forward channels; the elements popped up in appropriate, natural places. The surrounds added a light, supportive layer of crowd noise and some instrumentation as well. These moments didn’t engage in gimmickry, though. The instruments might be bolstered by the rears, but we didn’t find anything wacky or silly, so the back speakers added to the mix without anything to make them a distraction. Audio quality was always good. Vocals were fairly natural and crisp, while the instruments sounded accurate and distinctive. The mix seemed balanced, with clean highs and warm bass. The audio held up well over the last 33 years. One minor exception to this auditory rule: the “In the Cage” medley offered solely stereo material. It still sounded fine, but it failed to fill the rear speakers and it seemed less expansive than the rest of the concert. I’m guessing that the disc’s producers couldn’t get the original multitracks to remix the medley into 5.1. In terms of extras, we find seven audio-only bonus tracks. This domain presents full-length versions of “Behind the Lines”, “Duchess”, “Me and Sarah Jane”, “Man on the Corner”, “One for the Vine”, “Fountain of Salmacis” and “Follow You Follow Me”. Because it often acts more like a documentary than a concert film, these tracks don’t appear in their full glory during Three Sides - and a few of them don’t show up at all, as “Vine”, “Fountain” and “Follow” come from totally different tours. They all sound good and become a welcome addition to the set. In 1981, Genesis enjoyed solid popularity but hadn’t quite hit the heights they’d experience a few years later. Three Sides Live offers a good musical representation of the band in the early 1980s and usually provides a solid concert piece, though I’d prefer fewer cutaways from the stage itself. The Blu-ray presents acceptable visuals, excellent audio and a nice complement of bonus songs. Despite a few niggling flaws, I think Three Sides turns into a pretty good show.